Hosting a dinner party? Try these Southern Siberian favorites! Southern Siberia has strong culinary traditions. It has long been inhabited by livestock farmers who know a thing or two about cooking meat and holding feasts to feed family members and travelers alike. RBTH has selected dishes that are perfect for a big group. Altai (approximately 2362 miles east of Moscow) is home to many peoples, including Kazakhs, who are often referred to as the "Altai Kazakhs." They have enriched Altai's regional cuisine with their culinary traditions and customs, which took root very quickly. Thus, today you are sure to find a pack of small golden-brown donuts at the bread counter of most shops along the Chuysky Trakt (Russian road M52). These are baursaky, one of Southern Siberians' favorite treats. For Kazakhs and the Altaian people alike, baursaky are a type of bread that is shared with the entire family around the table. Be it a wedding, an anniversary, the birth of a child, or a funeral, not a single feast is held without baursaky; they are baked in heaps to ensure that everyone gets some. They look and taste like donuts, but nuances differ, as every family has their own baursak recipe. This pastry is loaded with calories, but as soon as you take the first bite of a hot, crispy baursak, it's quite hard to control yourself. On major Altai holidays, baursaky are fried in huge cauldrons, resembling pots for plov (rice pilaf). First, frying oil is poured in the cauldron, then frozen mutton fat is added to create a boiling sea of oil, where small pieces of dough are thrown in and fried until golden brown. It is tricky to recreate this complex ritual at home, but you can use a wok or a small metal pot instead of a large cauldron. Mix a cup of flour, yeast and sugar in a deep bowl, then pour in 1.5 cups of milk to make the initial batch of dough. Let it sit in a warm place for 20 minutes. As soon as bubbles appear on the surface, add the remaining three cups of flour and salt, then pour in 50 grams of oil. Knead the dough thoroughly and leave it for a couple of hours to rise (during this time, knead it a few more times). When the dough is ready, roll it out in cylinders and cut them into small pieces. Roll the dough pieces in flour, press them gently with your fingers and cover with a kitchen towel for 20 minutes. Then put the baursaky into a casserole dish with heated oil and fry until golden brown. Take them out using a skimmer, so that the oil drains back into the dish. Visiting Buryatia (approximately 3498 miles east of Moscow) and not tasting local meat delicacies is almost the same as visiting Paris without seeing the Eiffel Tower. Many regional meat dishes are quite basic. However, since livestock farming is the basis of local economy and the quality of meat is high, they are delicious even if quite simple. The traditional bukhlyor soup, which is cooked in almost every family, is a great example. 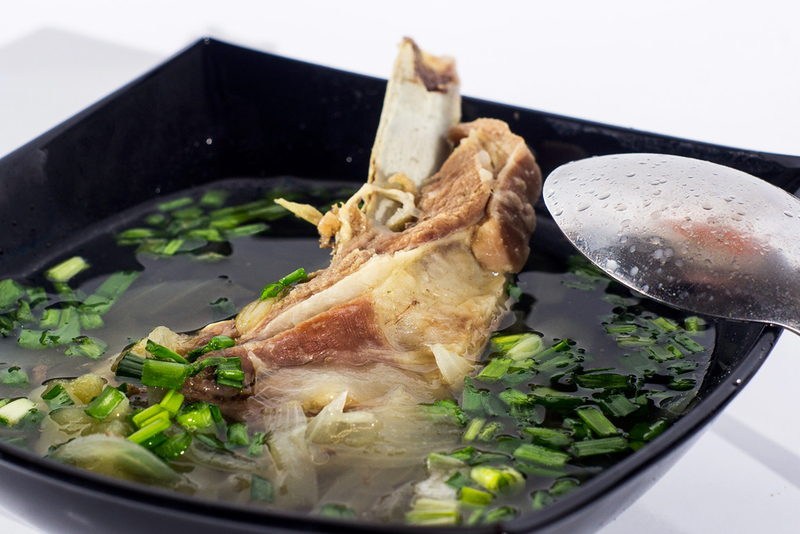 The name of the dish has a straightforward meaning: meat broth. In essence, it is thick mutton stock. Siberian indigenous peoples believe that meat, unlike fish, "warms up" the body and restores strength. Just like baursaky, bukhlyor is best cooked in a thick cauldron, which is a traditional type of casserole dish in Southern Siberia. Cover the meat with cold water and put it over heat either the stove or an open fire. Wait until it boils, skim the broth and salt it. As soon as the broth starts boiling again, put three peeled, whole onions in. Turn the heat down and simmer the soup for about an hour. While bukhlyor is cooking, chop the three remaining onions with greens and stir in some ground black pepper for the mixture to give off juice. Add it to the broth an hour later, stir, cover with a lid and let the soup sit for 15 minutes. The broth is served with large slices of beef.